Read about Todd Skinner's career history, by Ann Krcik. "We cannot lower the mountain, therefore we must elevate ourselves." Welcome to Todd Skinner's website, dedicated to his speaking career, philosophies, and accomplishments. 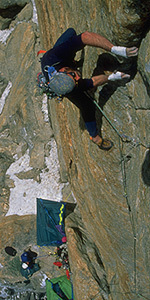 Todd died in a climbing accident in Yosemite National Park on October 23, 2006. Widely acclaimed as a legend and visionary first ascentionist, Todd Skinner also was one of the country's most sought after adventure based motivational speakers. For over a decade his dynamic presentations were catalysts for creating positive change for individuals and in the many corporate environments he touched. 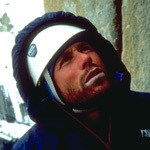 Todd's "Beyond the Summit" presentation, given to hundreds of corporations, centered around his historic first free ascent of the east face of Trango Tower in the Pakistan Himalayas. While more than 2,500 people have climbed Mount Everest, Todd Skinner assembled teams and created strategies for summits never before achieved. He was motivated by climbs where success required a lifetime's vision, tenacity and creativity. Knowing that the Trango Tower ascent would be more difficult for anything in climbing history set the tone for amazing teamwork and remarkable individual achievements. In his keynote presentation, "Beyond the Summit," stunning expedition photography featured in National Geographic, would light up the stage with fantastic views of the Karakoram Himalayas as Todd recounted the story of his heart-stopping first free ascent of the east face of Trango Tower. The sixty-day climb up the mile-high sheer rock face to the 20,500-foot summit represents one of mountaineering's most spectacular feats and remains the most technically difficult ascent ever completed in the Himalayas. The adversities of altitude, extreme weather, unknown terrain, and living twenty-four hours a day suspended thousand of feet up in thin air combined to form a striking parallel to the challenges encountered everyday in the business world. When a company brought Todd Skinner in to present "Beyond the Summit" they heard what it's like to break new ground, challenge traditional thought, and maintain tenacity for the summit. Todd explored unique strategies for goal setting, leadership, and decision-making. By giving his audience a different way to look at challenges, he helped them gain insight into their own personal ascents. Todd Skinner was represented exclusively by Ann Krcik at Extreme Connection Speakers Bureau. Thank you for your interest in Todd and in keeping his impact on the world alive. His death is an immeasurable loss, but his legacy of inspiration and joyous endeavor remains with us all forever. We hope that you will look through this website and visit Todd Skinner's Expeditions site to learn about Todd's philosophies, accomplishments, and expeditions.